I'm reading Simon Schama's delicious 'Face of Britain', and so I pootled along to the National Portrait Gallery today in order to have a look at one or two of the pictures he has written about. Once in, I decided to stick with the 18th century, and look for the striking or the kind among the worthies. Uppermost, I wanted to see Sir Thomas Lawrence's portrait of William Wilberforce. I found it in a room dedicated to the Abolitionist movement. What a picture it is. I'm fairly sure there can't be a more lovely face in the entire collection, both intelligent and kindly. He seems to glow. Perhaps it is the dark chocolate coloured background halo around the head, and the fact that the body remains only sketched in, which gives the face this luminescence, but I think more likely this was Lawrence at the top of his game painting an exceptional man. Other stuff that caught my eye: Tom Paine with the gaunt, goaty look of the radical - Ken Loach, Jeremy Corbyn; Sir John Fielding, the great and just magistrate, somehow appropriately blind (the painter someone called Nathaniel Hone); the deceptively soft-faced Edmund Burke by Reynolds; Lawrence's disdainful Wellington. There are first class Reynolds portraits of Laurence Sterne and Joseph Banks. JR much better than I remember him being. The face I liked best after Wilberforce's is that of Lord Mansfield, by Copley. 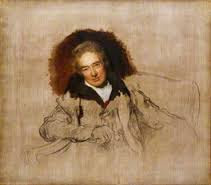 Mansfield, like Wilberforce, was a good man, and he looks it. No postcards for any of them (fine if you want Bowie, Kate Moss or Tracey Emin; Keats gets a card but not Wordsworth). Big Picasso portraits show on: crowds. I liked wandering back into the 18th century.